Army ant (or legionary ant) is the common name for the members of more than 200 known ant species, in different lineages, characterized primarily by their aggressive predatory foraging groups, known as "raids," in which huge numbers of ants all forage simultaneously over a certain area, attacking prey en masse. They also share the habit, unlike most ants, of not constructing a permanent nest and an army ant colony moves almost incessantly over the time it exists. Army ants do not represent a formal taxonomic rank and are scattered over 18 genera in 5 or 6 subfamilies (depending on the taxonomic scheme). All species are members of the true ant family Formicidae, but there are several groups that have independently evolved the same basic behavioral and ecological syndrome. This syndrome is often referred to as "legionary behavior," and is an example of convergent evolution. Most army ants are found in the tropics and subtropics, including Africa, southern Mexico, Central and South America, Australia, and Asia, although some species reach as far north as Iowa in the United States (Youth 2007). Most New World army ants belong to the subfamily Ecitoninae. Eciton burchellii, whose common name is "army ant," is considered to be the archetypal species. The unique swarming behavior of army ants adds to the wonder of nature for humans. Although many species, such as those in North America, have unobtrusive colonies with small raiding columns, some driver ant species of the Old World genus Dorylus can have columns of over 20 million individuals, using powerful jaws to consume animals in its path. At first glance, army ants may appear destructive to ecosystems and valueless to humans. However, ecologically, army ants have keystone functions in tropical forest ecosystems, serving in food chains as predators and prey, as well as hosts for parasites and commensuals (Youth 2007). They eat a variety of invertebrates, such as tarantulas, scorpions, other ants, beetles, roaches, and grasshoppers, as well as small snakes, lizards, frogs, and other small creatures, while being preyed upon by birds and mammals such as chimpanzees (Youth 2007). They pose little threat to mammals and birds (Youth 2007). For humans, while at once adding to the wonder of nature, they have been known to have a beneficial value in farming communities by removing agricultural pests. Because of their strong jaws, some are used in East Africa as natural, emergency sutures. Of the world's approximately 9000 ant species, there may be about 300 that can called army ants for their group-hunting habits and frequent migrations (Youth 2007; Hölldobler and Wilson 1990). Historically, "army ant" referred, in the broad sense, to various members of 5 different ant subfamilies: Ponerinae, Myrmicinae, Dorylinae, Leptanillinae, and Ecitoninae. In two of these cases, the Ponerinae and Myrmicinae, it is only a few species and genera that exhibit legionary behavior. In the other three lineages, Ecitoninae, Dorylinae, and Leptanillinae, all of the constituent species are legionary. More recently, ant classifications now recognize an additional New World subfamily, Leptanilloidinae, which also consists of obligate legionary species, and thus is another group now included among the army ants. A 2003 study of thirty species indicates that the ecitonine and doryline army ants together formed a monophyletic group: All shared identical genetic markers that suggest a common ancestor. Brady concluded that these two groups are therefore a single lineage that evolved in the mid-Cretaceous period in Gondwana (Whitehouse 2003), and so the two subfamilies are now generally united into a single subfamily, Ecitoninae, though this is not universally recognized (Engel 2005). Army ant taxonomy remains ever-changing, and genetic analysis continues to provide more information about the relatedness of the various species. Many genera contain large numbers of taxa at the rank of subspecies (for example, Dorylus, in which some 60 of roughly 130 named taxa are only considered subspecies at present). A representative individual from the soldier caste of the New World army ant species Eciton burchelli with characteristically shaped mandibles. Most New World army ants belong to the subfamily Ecitoninae. This subfamily is further broken into two groups in the New World, the tribes Cheliomyrmecini and Ecitonini. The former contains only the genus Cheliomyrmex, and the tribe Ecitonini contains four genera: Neivamyrmex, Nomamyrmex, Labidus, and Eciton, the genus after which the group is named (Brady 2003). The genus Neivamyrmex is the largest of all army ant genera, containing some 120 species, all in the United States. The predominant species of Eciton is Eciton burchellii, whose common name is "army ant" and which is considered to be the archetypal species. The Old World army ants within Ecitoniane are divided between the two tribes Aenictini and Dorylini, each of which is made up of a single genus. In the former case, it is Aenictus, which contains over 100 species of army ant, while the Dorylini contains the aggressive "driver ants" in the genus Dorylus, of which there are some 70 species known. Often, taxonomic schemes include Aenictini within Dorylini, giving just one Old World tribe. There are about 150 species of army ants in the New World (that is, North, South, and Central America). Although these army ant species are found from Kansas to Argentina, few people in North America realize that there are plenty of army ants living in the United States, in part because the colonies are rarely abundant, and because the United States species (mostly genus Neivamyrmex) are quite small (~5 mm), with small and generally unobtrusive raiding columns, most often active at night, and easily overlooked. Eciton burchellii and Eciton hamatum are the most visible and best studied of the New World army ants because they forage above ground and during the day, in enormous raiding swarms. Their range stretches from southern Mexico to the northern part of South America. There are over 100 species of army ants in the Old World, with approximately equal numbers in the genera Aenictus and Dorylus. The latter group is by far the better-known. Known as "driver ants" or "safari ants," members of the genus Dorylus are found primarily in central and east Africa, though the range extends to tropical Asia. There are some 70 species presently recognized, though another 60 names are applied at the rank of subspecies. Unlike the New World members of the Ecitoninae, they do form anthills, although these are temporary (lasting anywhere from few days up to three months). Each colony can contain over 20 million individuals. As in their New World counterparts, there is a soldier class among the workers, which is larger, with a very large head and pincer-like mandibles. They are capable of stinging, but very rarely do so, relying instead on their powerful shearing jaws. All Dorylus species are blind, though they, like most varieties of ants, communicate primarily through pheromones. 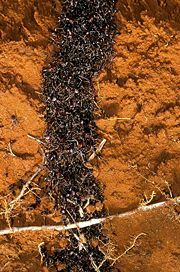 Seasonally, when food supplies become short, they leave the hill and form marching columns of 20 million ants. They can be considered a menace to people, though they can be easily avoided; a column can only travel about 20 meters in an hour (Youth 2007). It is for those unable to move, or when the columns pass through homes, that there is some risk of injury or asphyxiation, although generally only to the young, infirm, or otherwise debilitated. Their presence is, conversely, beneficial to certain human communities, such as the Maasai, as they perform a pest prevention service in farming communities, consuming the majority of other crop-pests, from insects to large rats. Their main diet consists of invertebrates, such as tarantulas, scorpions, other ants, roaches, beetles, and grasshoppers, as well as small reptiles and amphibians (Youth 2007). They pose little threat to most mammals and birds, which in turn consume the ants, with some bird species apparently dependent on the swarms (Youth 2007). Up to fifty bird species have been found to follow army ant swarms in the Amazon basin (Youth 2007). The bite of the large soldier ants is severely painful, each soldier leaving two puncture wounds when removed. Removal is difficult, however, as their jaws are extremely strong, and one can pull a soldier ant in two without the ant releasing its hold. Such is the strength of the ant's jaws, in East Africa they are used as natural, emergency sutures. Maasai moroni, when they suffer a gash in the bush, will use the soldiers to stitch the wound, by getting the ants to bite on both sides of the gash, then breaking off the body. This seal can hold for days at a time. Engel, M. S., and D. A. Grimaldi. 2005. Primitive new ants in Cretaceous amber from Myanmar, New Jersey, and Canada (Hymenoptera: Formicidae). American Museum Novitates 3485: 1–24. O'Donnell, S., M. Kasparim, and J. Lattke. 2005. [Extraordinary predation by the neotropical army ant Cheliomyrmex andicola: Implications for the evolution of the army ant syndrome. Biotropica 37: 706-709. Whitehouse, D. 2003. Ant history revealed. BBC News May 10, 2003. Retrieved September 8, 2007. Youth, H. 2007. Birds in swarm’s way. Zoogoer July/August 2007. Smithsonian National Zoological Park. Retrieved September 8, 2007.